Stir together the paprika, salt, sugar, chili powder, chipotle powder, black pepper, garlic powder, onion powder, and cumin in a small bowl until blended. Rub the seasoning mix all over the flat iron steaks, then wrap them tightly with plastic wrap. 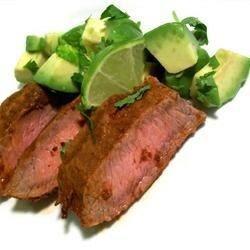 Marinate in the refrigerator 2 to 8 hours (the longer the better). Tasted like taco seasoning on steak. I created this recipe and just wanted to offer a different spin on it. Replace the brown sugar with peach jello powder, sounds weird but gives a nice back flavor to it. Yum! Loved it. I seared and broiled the steak as I can't figure out my barbeque :) Still delicious! Wow, delicious and easy. I tenderized the steaks after I'd applied the rub and they were phenominal!